The recent announcement of the “Platte Fifteen” Cross Laminated Timber building in Denver is great news, for many reasons. Platte and 15th Streets, formerly the home of Natural Grocers and Confluence Kayaks, will soon become the site for Platte Fifteen — a 151,736-square-foot mixed-use retail and restaurant space and 7,000-square-foot rooftop deck. Designed by OZ Architecture, Platte Fifteen signifies the first building in Denver to be constructed of cross-laminated timber (CLT) — a material that is both sustainable, stable and aesthetically pleasing, mimicking the look of heavy, old-growth lumber. So now we have a new option for building vibrant commercial centers using a remarkable material that is completely renewable and that, during its production, absorbs carbon dioxide from the air and releases life-giving oxygen. I am talking, of course, about wood. Trees. For unlike other building materials, trees grow back in a natural, sustainable, climate-friendly cycle. Lumber has, and still is, used to frame and complete residential homes. But for decades, construction companies in Canada and Europe also have made much larger structures known as “mass timber buildings,” using wooden materials such as cross-laminated timber (CLT) and glue-laminated beams – one such structure in London, U.K. is nine stories tall. Smaller pieces of wood are put together in panels up to 64 feet long, and these large panels then are assembled to build the building. The technical aspects of building big with wood have been overcome. 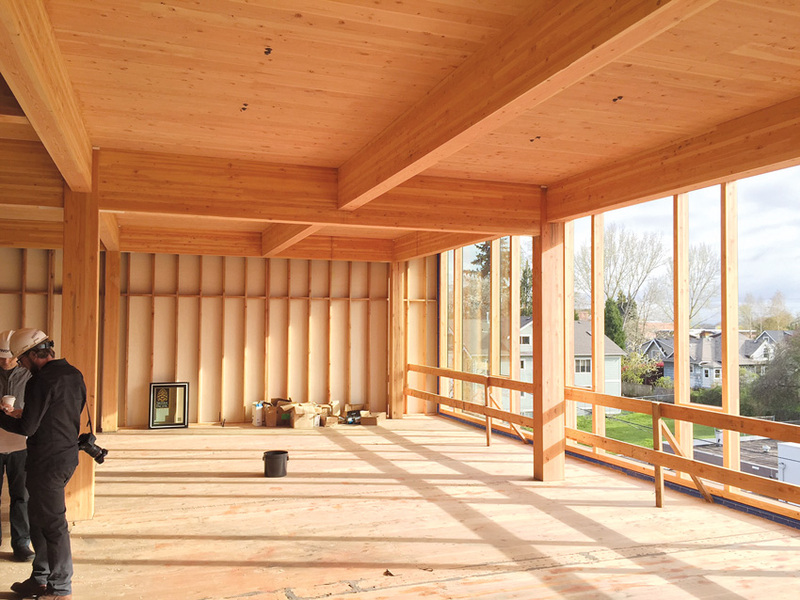 Many builders, engineers, contractors, and architects are learning new techniques and embracing new thinking, so they can use CLT and glue-laminated beams in commercial buildings. They also are talking to their clients about why these wood-based products may be appropriate for their projects and are educating them about the advantages of CLT construction. For example, properly designed, mass timber buildings can carry a load more efficiently than either structural steel or concrete. This quality enables designers to eliminate perimeter beams, which can produce a cleaner, lighter structure. In the building industry, stronger and lighter means that the project will use less material, and so has the potential to save both time and money. The more difficult obstacle to overcome though, exist in people’s minds. Building codes in most U.S. cities limit wood-based structures to just four stories, but in truth mass timber buildings have the potential to reach 30 stories or more – and they can be just as safe from fire and other hazards as steel and concrete structures. The technology of building with wood has changed, and slowly we are seeing local building codes change as well. In addition, many people worry about deforestation worldwide. They also remember a recent history when the U.S. government allowed clear cutting in some of our national forests. But mass wood buildings don’t need to be built from rainforest trees or even the forests in our parks or wilderness areas. Instead, more common trees that are about 10- to 15-years old are the best candidates to use for mass wood buildings. We all know that wood is an elegant material. Today, technology enables us to start applying this renewable resource to our grandest urban skyscrapers. Nature’s quiet giants can help humanity cleanse our air — and provide us with strong, sustainable, versatile, and beautiful buildings.